The other week, a patient with a chronic cough exclaimed to me that she wished the fictional character Dr. House of TV fame actually existed in real life, because he was somebody who can diagnose anything. In the real world, patients expect doctors to have the correct diagnosis from the beginning (might forgive one wrong diagnosis). 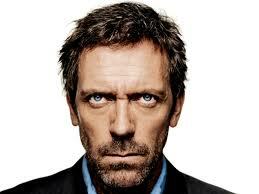 Dr. House seems to always get things wrong multiple times before he gets it right. I seriously doubt most patients would have stuck around as long as they do on the TV shows before going elsewhere. In order to achieve that correct diagnosis, Dr. House seems to pursue invasive tests which in reality is something patients rarely like to pursue... and often get second opinions to determine if really needed. Dr. House is fairly abrasive with his colleagues and even with his own patients which pretty much guarantees one star ratings on physician rating websites like HealthGrades.com and Vitals.com. Dr. House is addicted to vicodin, morphine, and cocaine... That pretty much guarantees loss of hospital privileges and perhaps even his medical license to practice in the real world. Furthermore, what would you do as a patient if you found out that your doctor abuses drugs??? Most will go elsewhere. So given what I know patients want in reality, it boggles my mind why patients in the real world think Dr. House is so great and wish a fictional character like him truly existed. To flip things around... the real question is why aren't real world patients more forgiving of physician fallibility like those on TV? I'm the first to admit that physicians (in the real world) are not perfect though the expectation is that we are.